This Acebil Bundle features the J-805MX Prosumer Tripod System and the SZ-300 Zoom Controller. It supports up to 8.8 lb loads and allows you to control zoom and record start/stop remotely. 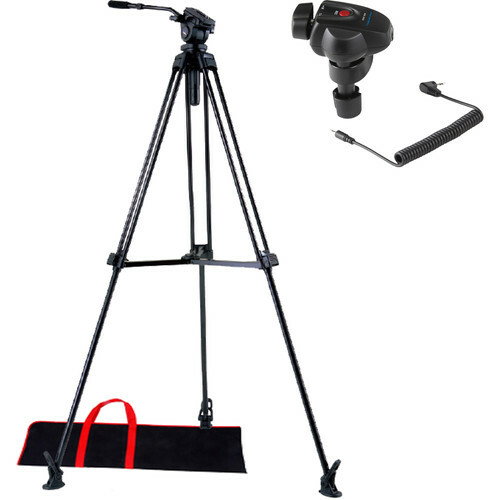 The tripod system includes a fluid head, quick release plate, mid-level spreader, and carry case. The zoom controller comes with a 20" coiled cable and is compatible with Canon protocols, Sony/Canon LANC, and JVC and Panasonic HDV cameras. The Acebil J-805MX Prosumer Tripod System includes a single stage, lightweight (9.1 lb / 4.12kg) aluminum tripod, the 805 fluid head, a middle spreader, and the s-30 carry case. Capable of supporting up to 8.8 lb (4kg), the J-805MX provides an optimum solution for small and high performance MiniHD camcorders. The aluminum tripod can be adjusted to a height ranging from 34.2“ to 59” (86.8 - 149.8 cm), and the middle spreader holds the legs in two positions (45° and 90°) and provides augmented stability and rigidity. You can achieve fixed counter balance and drag by means of the included 805 standard head. A convenient standard leveling base with 75mm ball diameter is provided allowing tilt angles of +90° / -60°. Camera mounting is provided via a quick release slide plate. You can use the s-30 soft carry case for storing the J-805MX tripod system. The SZ-300 Zoom Controller from Acebil is designed to work with the Canon protocols, Sony/Canon LANC, JVC HDV cameras, and Panasonic MiniDV or HDV cameras. It features a built-in auto switch, variable zoom, record start/stop, and can be used as a 3-in-1 remote. Box Dimensions (LxWxH) 40.0 x 9.0 x 8.0"
Box Dimensions (LxWxH) 5.2 x 4.0 x 2.9"